A few years back my entire Second Life revolved around Cool Beans. Cool Beans started as a very small and oddly made coffee shop on the Effington Woods sim. It grew over time to be the name of my estate, the name of my gacha yard sale and more. I lived and breathed Cool Beans. I cannot even count the number of different looks and locations I had for it over the years. 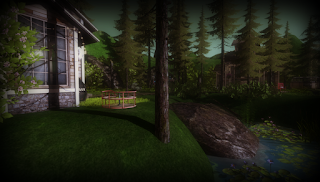 Then one day it was gone...I was growing tired of Sl, growing tired of maintaining the estate, tired of gachas. Recently though I decided the idea of Cool Beans as a hangout was one I wanted to explore again. I bought an extra parcel on the region I rent on and set to work. My original plan was for another very traditional looking coffee shop. A big building with a variety of sitting areas arrayed around the property, a small garden and lake. I decided though to go with something a little different, and I am so far loving how it turned out. Those looking for a small place to relax and chill with friend are welcome by the new Cool Beans Garden Cafe.